Team Blacksheep: Is Krytac soon to become Calamari? News update and a clear sign the Kracken is soon to be Calamari. Krytac released a press release about “Evike.com will become Exclusive Distributor in the U.S.” which means Evike will be the stocking warehouse for the USA market instead of Krytac stocking their own product and fulfilling orders which have always been a struggle for them. Does this seem like a good idea to have Evike handle all the orders and shipments to the customers? Yes, for the customers but what about the retail stores that carried the products? I wonder what the press release from Lancer Tactical will be about this? "no selling counterfeit or using branding from any others" but they are copying and stealing not just from Revision and caught at SHOTShow but a long list of many other companies and no way to deny any of their wrong doings. So busted! As most of you all know Lancer Tactical had a serious run in with Revision at SHOTShow 2017 and the Owner of Lancer Tactical was arrested. There have been claims of this and that but lets take a look at the public and present facts about this. Lancer Tactical claims to have now produced any Counterfeit or Fake products but we can see through that non-ANSI rated lens they sell so cheap to Airsofters. Not good at all and showing no care for the Airsoft Community and their safety. SB 199 Update: Airsoft GI is not sitting back despite what another retailer may be spreading on social media. Airsoft GI and our California political allies are working closely together to monitor and fight the bill. Airsoft GI does not believe, as a responsible business, in soliciting monetary contribution from our loyal customers to help fuel the fight for our rights. As one of the leaders of the airsoft industry, we will continue to be the model of a responsible retailer. We will act responsibly as representatives of our company, its customers, and airsoft as a sport. We will continue to educate the community on safe and responsible airsoft play. Airsoft GI was one of the oldest members of ASF and we will continue our battle against this bill. Airsoft GI will continue to be a responsible business in this society by helping needed veterans and contributing to non-profit organizations such as Wounded Warriors and Red Cross. Another round of the "Too Cheap to be True" Mystery Box is going live this Saturday 02/08/2014 at 4:00PM PST. $19.99 at your chance for the grand prize! Grand Prize: WE MSK GBBR valued at $380.00. Train with REAL Law Enforcement and Military Operators at Bob’s Rebel Training Camp. Game tickets are almost out! Be sure to purchase your game ticket(s) today. Bring your friends and family for a fun filled game day. Get to meet Bob and the GI Crew, sign autographs, etc. California Senate Bill 199 passed the California Senate, 22 to 8, today in Sacramento. This bill will now move on the the California State Assembly where it will most likely first appear in the Assembly Public Safety Committee. The strong airsoft showing in this committee for SB 798 in the Summer of 2011 made a huge impact on legislators, and it was probably partly responsible for its eventual defeat. That committee also taught us that action taken by out-of-state airsofters did not help our cause. We appreciate your enthusiasm, but please DO NOT contact California legislators if you are not a citizen of California. Encourage anyone you know in California to contact THEIR legislator. Right now the priority is for all California citizens to contact members of the California Assembly Public Safety Committee. Use the preceding link to find contact information for the committee members. The linked contact forms only work if you live in that particular Assemblymember’s district (Assembly Districts 15 ,17, 20, 54, 59, 67, and 75). You can then call on the phone, write snail mail, or email something like this. Airsoft Medicine has been working for over three years to keep airsoft fun by keeping airsoft safe. We do not find that SB 199 will make airsoft guns safer. The situation Senator De Leon is attempting to address with SB 199 was caused by a real gun bullet fired by a police officer as the victim was violating current law. The passing of SB 199 would not prevent such a situation from occurring again, but it would severely effect the sport of MilSim Airsoft played every weekend by thousands of Californians on insured fields and facilities across the state. 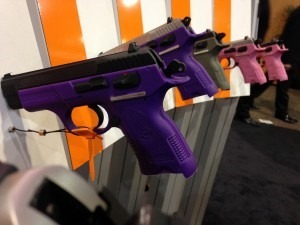 Please also note the coloration proposed by the bill is already used in real guns as shown in this picture I took this month at the Shot Show in Las Vegas. Senate Bill 199 will not make anyone safer. In fact, making airsoft guns look like toys increases the risk of parents and children not taking their potential for injury seriously. Please oppose SB 199 in its current form to protect our children, the MilSim Airsoft Sport, and the California Airsoft Industry. I think it fair to say that the recent events have been well publicised. I am of course referring to the leaked email from Frank Bothamley to other UKARA members containing ideas on how to rework the VCRA. I hope to address the issues raised in the email from a UKAPU perspective but also I want to avoid casting aspersions and name calling as it is counterproductive. Firstly, I want to deal with the manner in which it was brought to light. Whilst I have a huge amount of respect for ‘Yossers airsoft oddesy’ I believe the manner in which the story was broken was guaranteed to result in a vitriolic outrage in the online airsoft community. This could have been as counterproductive and as damaging as the contents of the email itself. I hope that ‘Yosser’ can take something from this experience as well as the retailers, Mr. Bothamley and the wider airsoft community. Secondly; we should bear in mind that the email contained ideas. These were not proposals that had been submitted to the Home office and accepted, they were not new laws they were just ideas. It is important that this is remembered. If these are submitted to the HO or the ACPO as they stand purely through others inaction as Mr. Bothamly alludes to then that would be another matter and one that UKAPU would fight as we do not agree with the recommendations in their entirety. 1. Mr. Bothamley approached the HO and the ACPO over 12 months ago. As Chairman of UKARA and dealing with issues relating around the VCRA then that is his prerogative to do so as the breaches of the VCRA he was reporting were not being dealt with. Due to the nature of these discussions, a heads up and some feedback to the other associations (and to the UKARA members) would have been a matter of common courtesy, and would be in line with the coordinated approach that we have agreed upon. 2. Any proposal that further limits the rights of players to purchase RIF’s places the control of second hand sales and personal imports into the hands of retailers is not something we would condone and would fight against it. There is no evidence that private imports and second hand sales are causing a problem. 3. Mr. Bothamley’s call for RIF’s to be sold through airgun weapon RFD’s is just that. It is not asking for reclassification of airsoft guns to airgun status just that they be sold via a checkable source. This isn’t necessarily the end of the world as it would do away with some of the less than honest retailers. It could have an impact on some of the smaller shops but it is for them to decide if gaining RFD status is worthwhile. It makes checking a whole lot easier for both the police and trading standards however. 4. UKARA would be defunct. Whilst the database and the association have been proven to be less than perfect and there are persistent accusations of new retailers being denied fair access, it has worked for the most part. It’s not perfect, and I believe that the database should be controlled independently, probably by sites, and with free access for all, in line with the original assertions that “it would not be a closed system”. With the system proposed by Mr. Bothamley, all that would be required would be proof of age. This would I think put us back to pre VCRA days, with RIFs available to all and thus all the problems that were perceived to exist prior to he VCRA would In effect exist once more. 5. The proposals for the withdrawal of second hand sales and personal imports as outlined in Mr. Bothamley’s Email concern us the most. If he wishes to follow the model for airgun sales then these should remain unregulated and UKAPU would fight for this right to remain. The result of this rather negative situation is that it has promoted discussion. Let’s hope that the outcome is more interest from players, sites and retailers in how they are represented. Bear in mind that, at the moment, we are doubtful that changes to these law are on the table. –The main point of UKAPU is that it’s a way to get your voice heard. As we will be speaking to ACPO and the Home Office in the near future, would members want us to support changes to the VCRA or not? Would you prefer to see reforms from within the community? If you do want to see changes in the VCRA and specific defence, what would you like to change? Do you feel that the VCRA is fundamentally working? Is it workable and enforceable and are problems with enforcement even an issue for the airsoft community, or the duty of the Police and Government? Please feel free to contact me directly at chair@ukapu.org.uk or join the discussion on our forum if this has made you think about our hobby’s future. This will be the next shoe to drop….along with more developing from MAGPUL’s real-steel magazines lawsuit, and their "whatever" with PTS, so far unconfirmed. So there has been some rumors about H&K guns not being available anymore starting 2013. These guns won’t be here for long as specials. They are selling fast. If you want to complete your collection and are missing a G36 or USP, you might want to get it now. I mean, heck, it’s on SALE! This is not to say we won’t be seeing your favorite H&K styled guns anymore. As long as the licensing is present, it’s properly authorized. The bright side of this is that; A)all our un-licensed H&K guns are on sale now and you have less than 30 days to get a hold of a great deal. 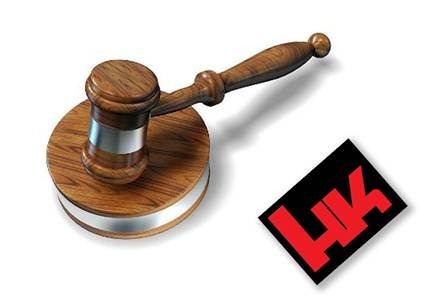 B) All future H&K replicas will all have proper trademarks for those of you who love seeing trades on an airsoft gun. 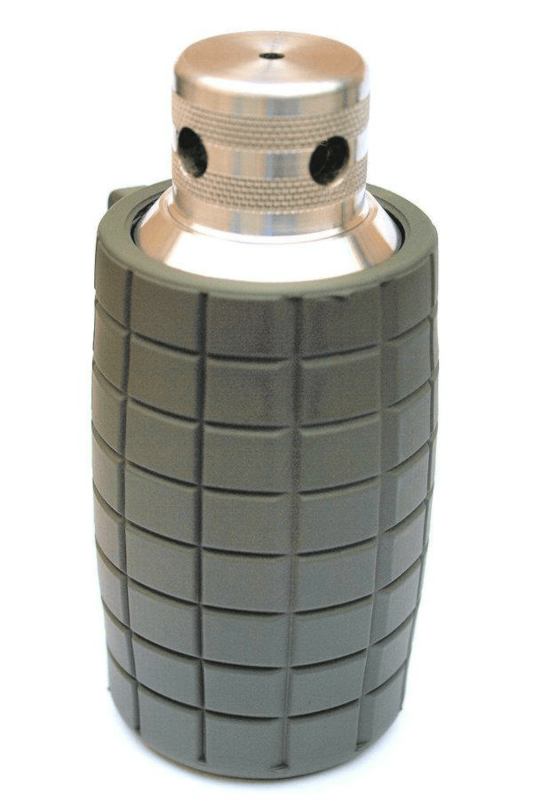 Arnies, Airsoft Odyssey has come into possession of SECRET INTEL regarding the much anticipated new DELAY type Blank Firing Grenade – known as a V.T.G. – Versatile Training Device. Each VTG will come as standard ready for both 12gauge & 9mm blanks, a totally re-designed custom loading tool, which will be much safer to use, a carabineer, a special VTG patch, and a flat spring ring ready for your grenade pins. THIS IS HUGE NEWS, ARNIE! They needed to do something with the MILLIONS of real AK’s that are being replaced/stockpiled…although they will likely be modified so that they can NOT fire or be easily modified into working firearms….as KWA just went through those hassles here in the US with the BATF, with both M4 AND AK-Gbb’s coming to market, it will be interesting to see if this takes off. SCOOPED over at the SCOOP.IT news site right now…we will be adding details as we get them! Thumpy: Does the Pippa gun case have a Paris connection? THE BIGGEST AIR STUPID EVER??? And a Paris Connection to Cyber-G? Could the Pippa gun incident be the biggest AIR STUPID ever? "Prince William’s new sister-in-law is expected to be questioned by police after her companion pointed the realistic-looking weapon at a photographer who was following them." From the Dailymail.co.uk story…link here…even if the gun was a fake/airsoft pistol, the penalities under French law are severe! "If the gun was real, those involved in the incident face up to seven years in prison. If it is a fake, they could be jailed for two years." "Sources indicated that the weapon looked similar to a Sig Sauer P226, used by numerous law enforcement and military organizations worldwide as well as by personal bodyguards." In addition, Nike is expanding their SFB to another color, as well as specialized socks. Next year they will be expanding into a full line of Combat Gear, including more footwear, gear, and apparel. The Special Forces Systems line will focus on lightweight, durable, high performance gear for the tactical athlete. We’ve heard about it for months, we’ve seen SOME of the concept art…now HERE IT IS! Tom Cole is the BizDevelopment Chief for Cybergun’s STORE AND GAMER’S LOCATION in the USA. TELL US WHAT YOU THINK..>In the comments tab below, on Thumpy’s Facebook….or on WordPress.com! And it’s from the Homeland of all things Arnie! Check out this very VERY cool video posted yesterday over on VIMEO! Dragon Valley Airsoft from FlyPix – Shikra on Vimeo. Cheers…hope you "got some" this weekend! Apparently, the Cybergun/Blackwater video game ‘genre’ has not worked out too well….information at the link above, and GOOGLE Translate is your friend, non-Francophones! Monsieur Marsac is also quoted in other places as pushing the blame off to the slow adoption of Kinect for the XBox as a contributor to the sell-off….hmmm, really? It might not have something to do with the OTHER two brands involved, and not the most popular console gaming system on EARTH?? ?